Mark is an accomplished singer who has vast experience as a solo 'Rat Pack' & Michael Buble entertainer. Having been in a previous line-up of the band, he was missing the thrill of singing with live musicians & jumped at the chance to join us again when the opportunity arose. 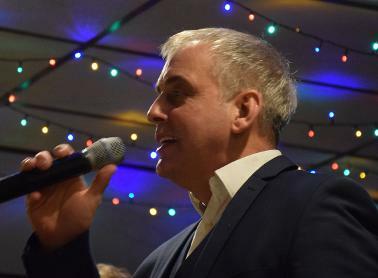 He is revelling in our Cliff Richard and 1960s repertoire and is proving really popular with our audiences. Geoff was drawn to the guitar on hearing Apache for the first time & Hank Marvin remains one of his great heroes. He was given his first guitar for his 15th birthday & later formed a Dorset-based group, The Hunters, who played extensively throughout the South-West and in France during the mid-sixties, winning Dorset Group of the Year in 1966. When his career saw him relocate to Essex, he took a break from playing and sold all his equipment. On retiring a few years ago, he treated himself to a red Fender Stratocaster and rediscovered the music of his youth. Whilst playing at the Friends of The Shadows Guitar Club in Southend he was invited to join Q&TS, an offer he enthusiastically accepted. He says it is great to be playing again in a band, with friends who are also talented musicians. Tony first got interested in playing the guitar aged 12 when he saw Joe Brown on the TV show 'Boy Meets Girl'. At school, he played with Colin King & The Royals who made quite a name for themselves in the South London/Kent area. After leaving school, he was intent on becoming a professional musician and followed the Mersybeat 'wave' by forming Jon Best & The Challengers. This resulted in the band touring the country, playing 5 or 6 nights a week and supporting the likes of The Hollies and Cliff Bennet & The Rebel Rousers among others. Tony soon became disenchanted with the music business, having not hit the big time, and sold all his equipment in order to buy his first car. In the 1970s, Tony dabbled in the local New Cross music scene but gave it all up again when his car was stolen and he lost his uninsured guitar and amplifier. 2008 saw him rekindle his love of guitar playing and, after a course of advanced guitar lessons, had the idea to form Q&TS with an old drummer friend and acquaintances from local Shadows guitar clubs. The rest is history! Jim first learnt the guitar in his early teens, encouraged by the TV appearances of Bert Weedon. His first band was largely made up of school chums and included Nigel Pegrum, who later found fame as the drummer with Steeleye Span. Later in life, Jim played both guitar & bass for over 20 years with the Mayflower Celeidh Band, playing for barn dances all over Essex. Following retirement, he has played with a number of local bands - Kon-Tiki, Alive & Kicking, The Evening Echoes and , most recently, Los Kiosk Bears. He also regularly performs as a solo guitarist, playing to backing tracks, at parties, dinners & choral concerts. However, he is delighted to be playing the music he enjoys most with the latest incarnation of Quiff & The Shades and is thoroughly enjoying himself. Like a lot of young people, Seb started off with a school friend to form a band entertaining family & friends, inspired by groups such as The Beatles and The Shadows. 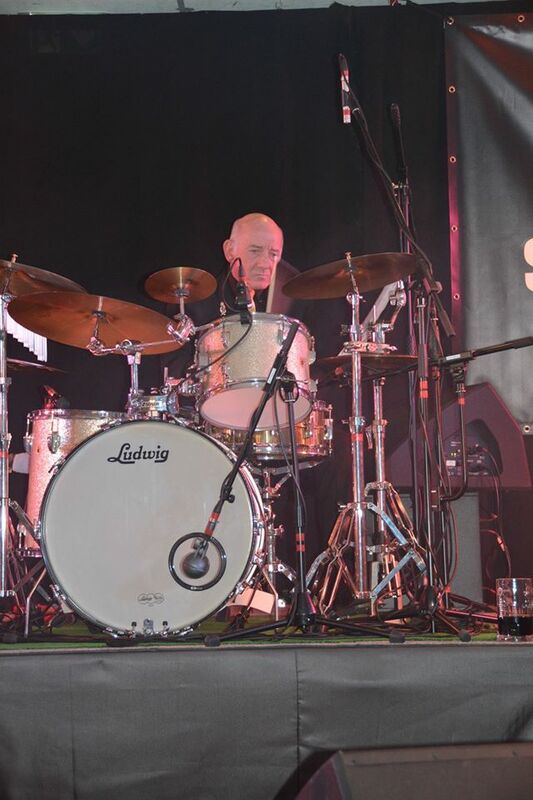 His drumming career has covered a variety of styles including big band, concert band, jazz, rock & roll and this has taken him to many places on the continent & UK. He has now returned to his roots with Q&TS, playing the patterns of his favourite drummer, Brian Bennett.